The giant red shrimp is a benthic-pelagic decapod crustacean found in the Mediterranean Sea and Atlantic and Indo-Pacific Oceans, tropical and temperate water. It lives on muddy and sandy bottoms of the continental slopes from 60 to more than 1000 m in depth. The length varies from 12-16 cm, females are larger and can reach 20 cm. It is ruby red, has a rostrum formed by more than 4 teeth on the back – females may have 5 or 6. It has a strong, spiny shell with five pleopods (swimmerets). The last abdominal segment ends with a fan-shaped tail. It is nocturnal, carnivorous and mainly feeds on small crustaceans. 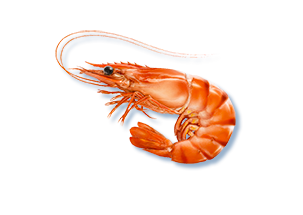 It is a very valuable species much in demand on the market and is marketed both fresh and frozen.